The 2014 London Toy Fair opened it's doors today with a flurry of activity. Unfortunately I was unable to attend the first day but we will be going tomorrow. First off, there was mainly a load of stuff we have already heard about but we were given some new pictures but there is one 'blaster' that has so far remained secret. All of the information I have received is below. Zombie hordes are no match for the ZOMBIE STRIKE SLINGFIRE blaster! The blaster’s lever-action allows for quicker reloads on the run and DIY-style designs lend an authentic feel to any NERF zombie attack. 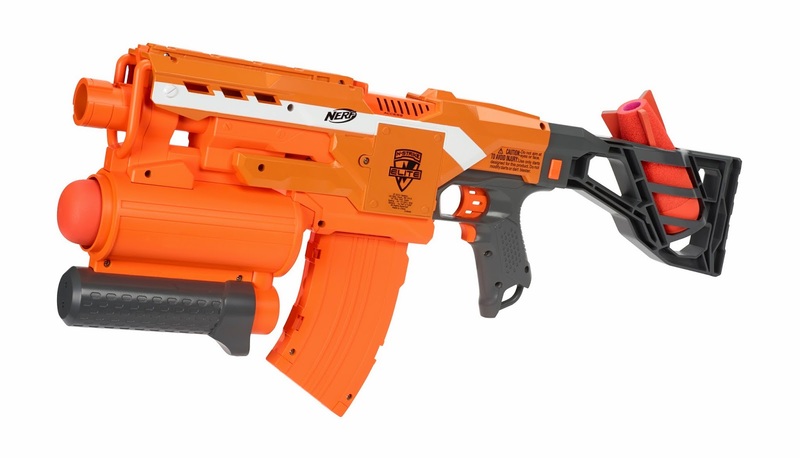 Blaster comes complete with one six dart clip and six ZOMBIE STRIKE darts which can be fired up to 75 feet. We all know about this puppy and if you don't, where have you been. This though is the first picture that gives us a true idea of the blaster's proportions. The barrel doesn't look as short as I feared and the stock looks nice and chunky. 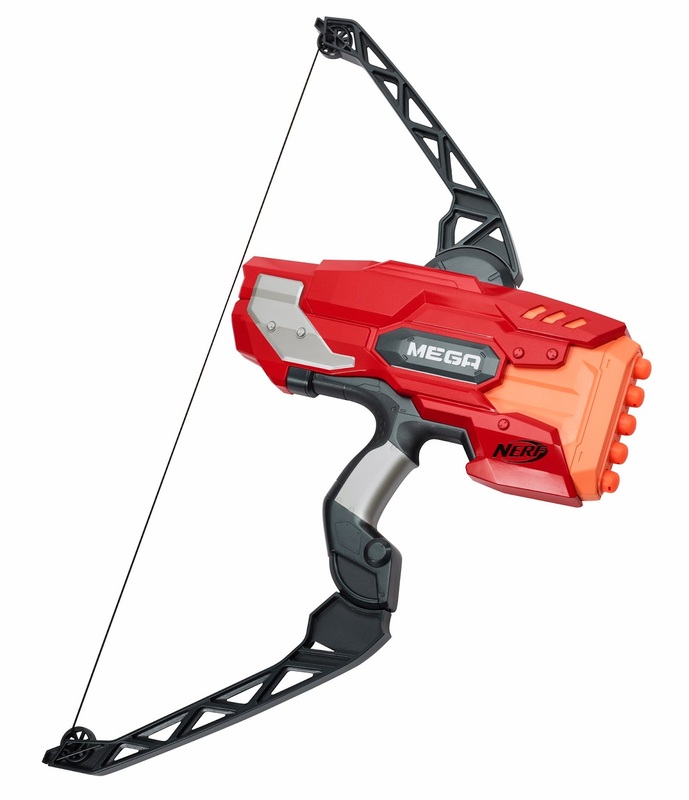 Awesome Nerf Mega performance transitions from blaster to bow with the addition of the N-Strike Mega Thunderbow toy. 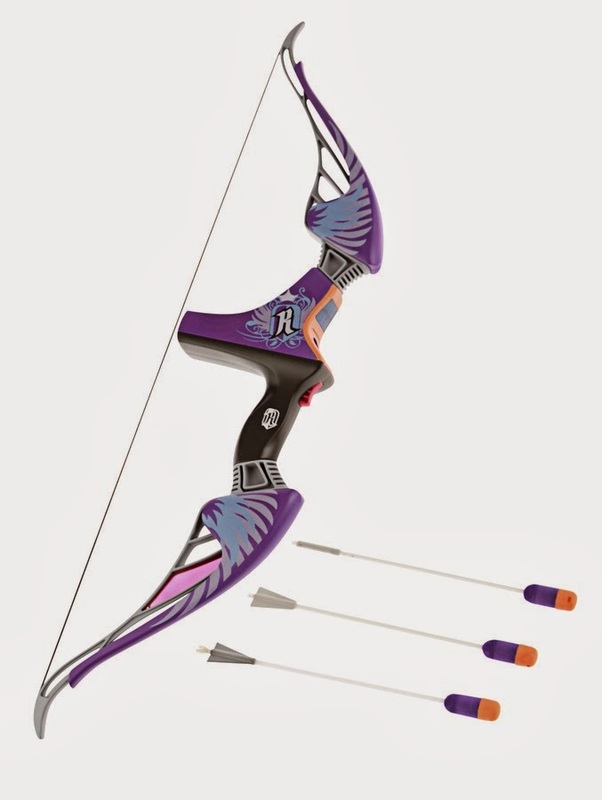 The bow’s dynamic arms and traditional pull back system can fire five Nerf whistler darts in a row up to an amazing 85 feet. Includes 10 Mega Whistler darts and holds up to five Nerf Mega darts at a time. Again, nothing new here. Lets hope this thing isn't as much of a derp as some fear. Take Nerf shots to the next level with the 2-in-1 blaster that dominates missions! The Demolisher 2-in-1 blaster is impressive in size and power firing up to 85 feet, featuring semi-motorized blasting, a 10 dart banana clip, and all new missiles. Blaster includes two missiles and 10 N-Strike Elite darts. A look at this blaster from the opposite side reveals a better idea of the 'grenade launcher's' dimensions. Sadly it does look as though it is permanently fixed to the blaster. I guess we'll find out for sure soon enough. My only concern is £44.99. Really? Seems a bit steep but you do get a lot of blaster for your hard earned money. I guess the proof of the pudding is in the eating. This thing is all brand new. I know what you're thinking... an actual bow. a bow powered bow! The foamy gods be praised! I love the look of this thing. You can't really get an idea of the dimensions yet but it looks real puuuurdy. Even on looks alone, I can already tell this is better than the heartbreaker. Remember folks, UK Nerf will be there tomorrow so for more information and some more pictures, check back with us tomorrow night. My trusty hacksaw says "nothing is fixed permanently!" Good call on the pricing, £5 more expensive than my guess. Could that be a real bow? Only testing will tell. That looks like an exclusive on the bow, nobody else mentioned it yet. We will know for sure tomorrow! Hope it's detached pls. OR that it requires assembly. That'd be great. Anyone else think of a hammer burst when they imagine the demolisher without the stock or launcher? Just want to ask both of you guys a question regarding this recent reveal by Hasbro/Nerf. I know that mylastdart did mention that the missile launcher was detachable, just wanted to ask if you guys could ask for an updated answer on if that may have changed? i'm sure the rest of the community is interested in this question as well. We hope to confirm this tomorrow. We will be there nice and early so you will know as soon as we do! very interested in the secret blaster, wonder if it has to do with the rumored mega vulcan or RPG. and it's consistent with being removable. Also, look closely at the back of the launcher, the Orange section behind the grey pump handle. There is a Orange tube looking section of shell leading vertically to the launch tube. That looks like the kind of shell tldesign they use to house air lines. Possibly air powered?? I hope you're right fella. I really do. Only 12 hours until we find out for sure.